I remember having comic books with the ad.The offer sounded too good to be true,and it was. 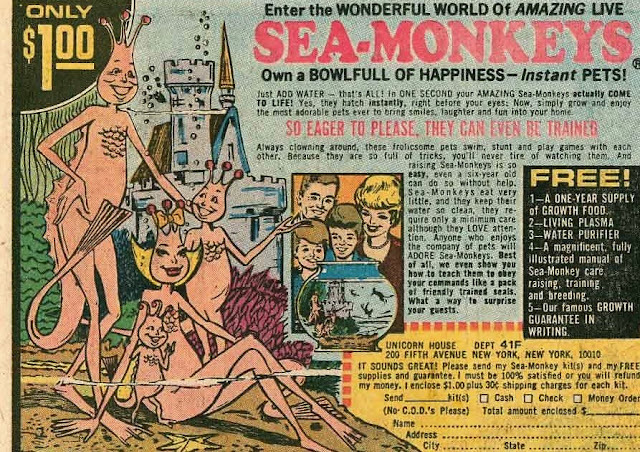 It was a bigger ripoff than Sea Monkeys,which I also ordered. They were only brine shrimp! "So eager to please they can even be trained...like a pack of friendly trained seals." Yeah right. 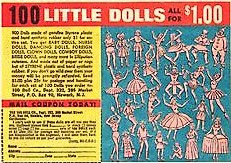 I'm pretty sure I ordered those '100 dolls', and when they came they were tiny pink plastic figures about an inch and a half tall. 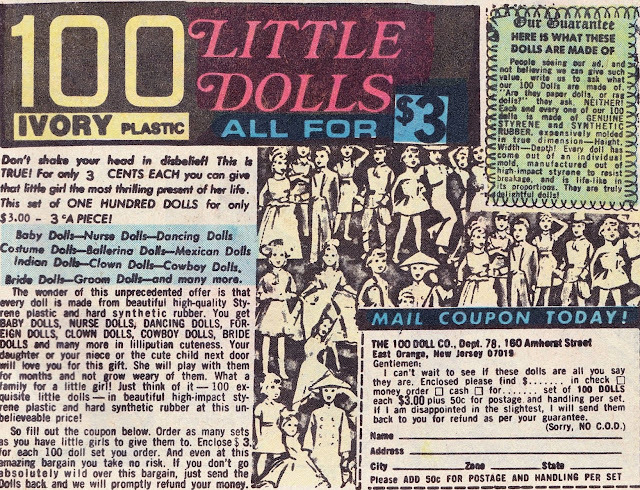 Today's doll isn't the spindly pink variety. She's a solid type of lady made from ivory coloured plastic. She's the West Indies lady. She must be one of these. This must be later than my childhood. Inflation had taken the price up to $3! by this time! 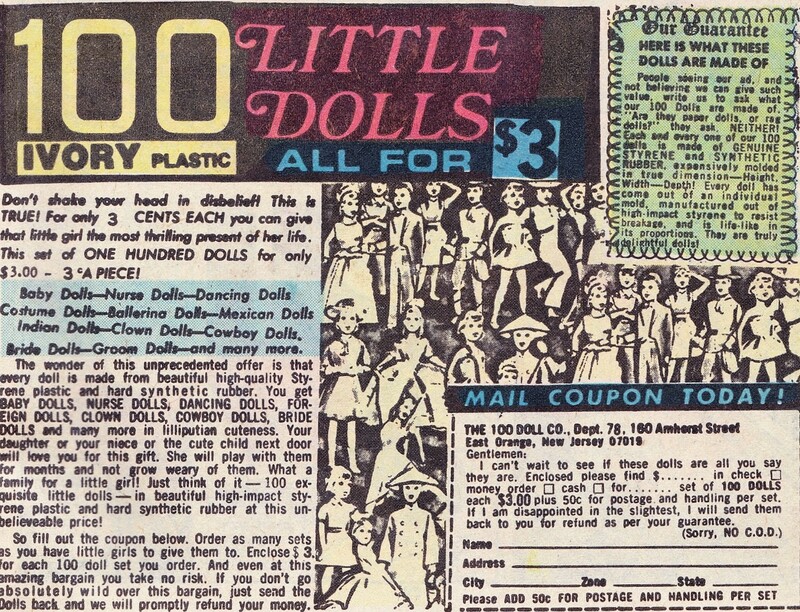 I thought she was a Crackerjack prize when I found her,but then I found out she was one of those '100 dolls'. 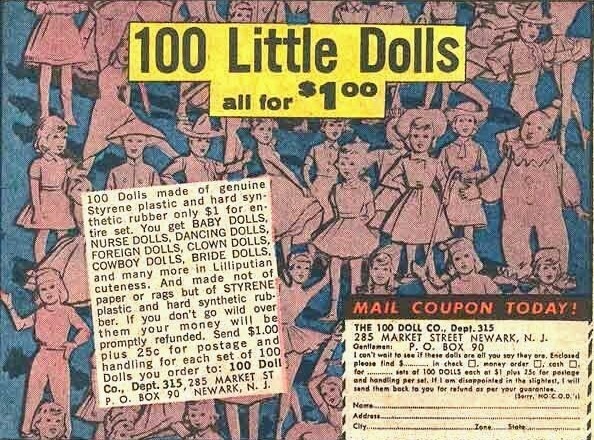 She's not exactly what I, (or probably most of the kids who ordered the '100 dolls'! ),would consider a 'doll',but she makes a nice little figure and looks good on a shelf in a 1/6 scale scene. She was kind of hard to photograph. I don't recall seeing those although I do remember sea monkeys "objects may be fanciful" was the warning on the packaging maybe after some complaints. These little figures look rather like they are the size of the now very collectible cereal packet toys. Yes,really similar. After Crackerjack, that would have been my next guess,until I found out what she was.